To coincide with the new FTD extended CD release of ‘Loving You’, EIN looks back at the fabulous 2003 book "Inside Loving You" by Ger Rijff & Chris Giles. Ger Rijff is renown for his magnificent books and this one examines Elvis’ life around the period of filming ‘Loving You’ in early 1957. Notably this is only the second book (after ‘Elvis: Caught In a Trap’) publicised in an FTD release. T.C - Had you ever come across anyone like Colonel Parker before? Hal Kanter - Not before and not since. I think he's a figment of a vivid imagination. He made up who he was. I remember he sort of hi-jacked the wrap party I organised on the last day of shooting. I hired this nightclub and invited everyone along who'd been involved with the picture. I'd paid for everything out of my own pocket and it cost a fair amount of money. About a hundred people were there having a good time - eating, drinking, dancing and so on. And when we arrived the first thing we saw was a booth that Parker had set up with a big sign on it saying `Elvis And The Colonel Thank You'. And there was Parker himself handing out pictures of Elvis and various other promotional gifts, making out that he'd organised the whole thing. The booked is crammed with memorabilia & photos from Chris Giles’s sensational collection and there are some truly stunning images in both colour (as above) & black & white. 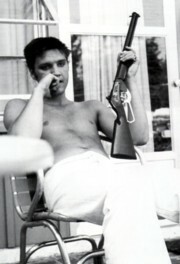 There are plenty of candid photos that I have never seen before, as well as images with Elvis’ family and co-stars. 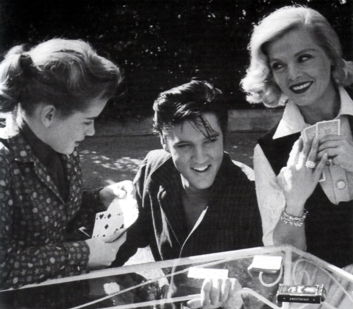 Publicity shot of Elvis and co-stars Lizabeth Scott & Dolores Hart. 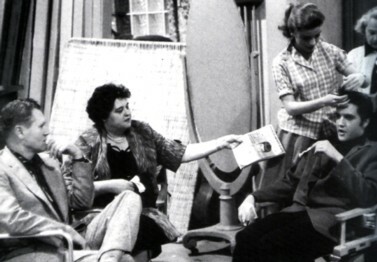 Elvis' parents Vernon & Gladys relax on the film set along with Dolores Hart. EIN note - These small sample images cannot represent the high production quality of the photographs in the book itself. 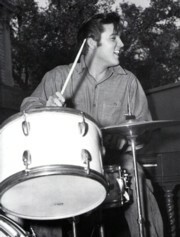 More great candids of Elvis in 1957. Some of the pictures of Elvis in this period are just sensational capturing the boy becoming the star. 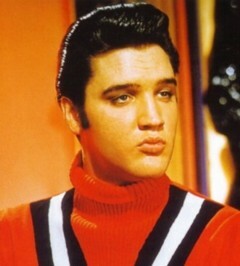 There is a real youthfulness, innocence, enthusiasm & intensity that you can see in Elvis’ eyes that will soon disappear. The newspaper clippings are interesting & now I also know what the infamous Radio Recorders studio looks like. If I have any complaints it would be that a few of the photos are printed a little dark and I would have personally liked more information & dates on some of the shots. On of my favourite photos. 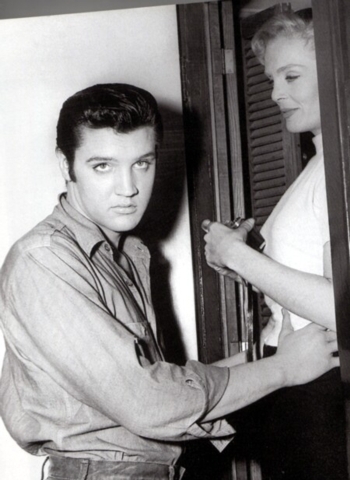 Elvis holds co-star Lizabeth Scott by the hips & gives the photographer & mean stare! 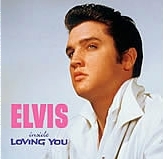 Verdict – ‘Inside Loving You’ is the perfect accompaniment to the new FTD extended Soundtrack CD release and was one of the great Elvis books of 2003. Exploring these images of Elvis at work & at play helps you understand the excitement & pressure on Elvis during this key year of his life. Things would never be the same. 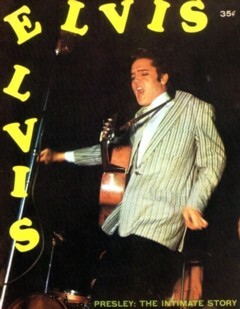 An essential book for fans of fifties Elvis. New review by Piers Beagley, copyright EIN - February 2006. Click here for the EIN in-depth review of the 'Loving You' FTD CD. Click here for EIN's original 'Inside Loving You' book review from 2003.